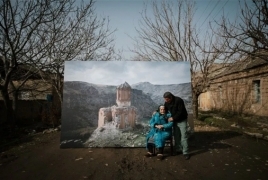 Venice Arts and Month of Photography LA (MOPLA) is presenting “1915”, the compelling work of photographer Diana Markosian that documents Armenian Genocide survivor Movses Hanesian and other survivors, as they reconnect with their lost homeland: what they had, what they lost, and what they have found again, MassisPost reports. The opening reception of the exhibit, part of Month of Photography LA, was held on April 13. The exhibit will stay open until April 30. Markosian was born in Russia and grew up in California, USA. Markosian is a Magnum photographer whose work explores the deeply personal, from documenting the lives of young Chechen girls coming of age in the aftermath of war, to her reconnection with her estranged father, to a film on the Armenian genocide survivors. Her work is both conceptual and documentary, allowing her subjects to dictate the outcome of their work. Her work can be found in publications like National Geographic Magazine, The New Yorker and The New York Times. She is a Magnum Nominee and the recipient of the Chris Hondros Emerging Photographer Grant, Magnum Emerging Photographer Fund, and the Firecracker Grant. In 2013, she took part in the World Press Joop Swart Masterclass in Amsterdam and was selected as PDN’s 30 Photographers to Watch. Her work “The Cubanitas” has won World Press Photo 2019 Contemporary Issues, Singles, 1st Prize.